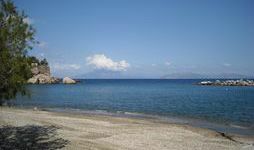 Therma is a small picturesque seaside village situated in a five km distance from Ag. 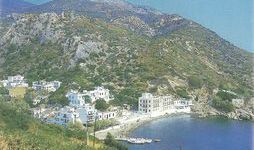 Kirikos, the capital of the island. Therma is a fully autonomous village since it holds restaurants, coffee and patisserie shops, grocery stores, bakeries and travel agencies. It is also connected to Ag. 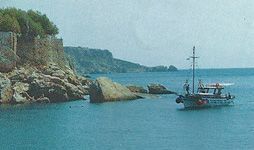 Kirikos by regular bus service and by small boats. But for those of you who like to walk, there an enchanting seaside 20 min. route that connects the two villages. In the village of Therma, visitors are given the opportunity to lie on the big sandy beach, swim in the crystal-clear Ikarian sea and also relax in the famous mineral springs of Therma. It is worth mentioning that the geographical location of the Ikarian mineral springs on the south-side of the island is the reason that, from March to October, there are no high waves on the beaches of the region, regardless of the summer wind intensities that might prevail. This phenomena, in conjunction with the fact that the springs and beaches are in close proximity to one another, means that spa therapy and swimming in the sea can be combined. 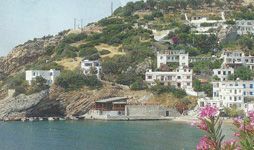 This is especially convenient for those who wish to visit Ikaria’s mineral spring and have brought young children with them who can enjoy the island beautiful beaches.